Many centuries had passed over the Church of Christ before there was any distinct feast of the Blessed Sacrament. And in the 13th century when Our Lord chose that it should be instituted, He had recourse to a simple nun in a vision to be the instrument of this devotion in His Church. St. Thomas Aquinas was living then, and so was King St. Louis, but God chose neither the learning of the one nor the royal power of the other to be the means of executing His desire. From the age of 16, Juliana of Liège (1193-1252), recurrently received the same vision when she knelt in prayer: A brilliant moon continually appeared before her with one small portion obscured and invisible. That Belgian canoness in the Augustinian canonry of Mont Cornillon tried in vain to chase the vision away. Finally Our Lord Himself came to explain it to her. First, in order that Catholic doctrine might receive aid from the institution of this festival at a time when the faith of the world was growing cold and heresies were rife. Second, the faithful who love and seek truth and piety could draw from this source of life new strength and vigor to walk continually in the way of virtue. Third, irreverence and sacrilegious behavior toward the Divine Majesty in the Blessed Sacrament might, by sincere and profound adoration, be extirpated and repaired. Then He bade her to announce to the Christian world His will that this feast should be observed. Fearful, the canoness beseeched Our Lord to be released from the charge. Our Lord answered her that the solemn devotion which He ordered to be observed was to be begun by her and to be propagated by the poor and lowly. For 20 years the secret lay hidden in Juliana's heart; she dared not reveal it to anyone, and yet an interior impulse urged her on so that she could not forget it. So terrible was her repugnance for the mission assigned to her that she shed tears of blood over it. At length she imparted the mission to her confessor, and with her leave he consulted others, especially Fr. James de Threzis, Archdeacon at the Cathedral of Liège. This priest was afterwards elected Bishop of Verdun, then Patriarch of Jerusalem and, at last, Pontiff of Rome, being called Urban IV. From the time it was divulged, it became a public question, and men were sorely divided upon it. 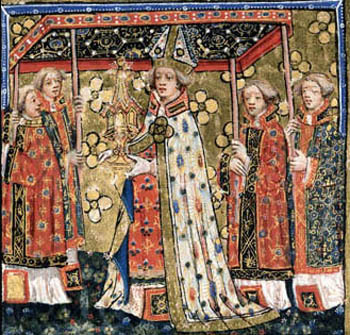 Many canons and monks protested against the new devotion and argued that the Daily Sacrifice was sufficient to commemorate the love of Jesus in the Blessed Sacrament - without a special day being particularly assigned for that purpose. Julinana prayed on as civic unrest and religious controversies raged around her; the city where she lived was lost and won in the waging Guelph/Ghibbelline struggle, sacked by a lawless army, and retaken. Three successive convents were either burned or otherwise destroyed over her head. Twice Juliana, now superior of the Convent and enforcing the strict Augustinian Rule, was forced to flee her convent. After the second time, she found refuge in a Cistercian convent, then another, and then among the poor Beguines. From there she took up residence in the Cistercian Abbey at Salzinners, and finally at Fosses-les-Villes, where she lived in seclusion until her death. Yet no earthly troubles could make her forget the task that Our Lord had assigned her. She died before it was accomplished, yet she had done enough in her lifetime to provide for its execution. In her wanderings, she had met with a few men with devotion and learning to defend the feast of the Blessed Sacrament and they helped to spread the devotion, especially among the simple people. After her death, Pope Urban IV, who was favorable to the feast, was asked to extend the devotion to the entire Church. The Eucharistic miracle of Orvieto in 1263 was instrumental in his final decision favoring the installation of the Feast of Corpus Christi. In 1263 a German priest, Peter of Prague, stopped at Bolsena while on a pilgrimage to Rome. At that time this priest was suffering a crisis of faith, doubting that Christ was actually present in the consecrated Host. While celebrating Holy Mass above the tomb of St. Christina in the church named after this martyr, he had barely spoken the words of Consecration when blood started to seep from the consecrated Host and trickle over his hands onto the altar and the corporal. At first the priest attempted to hide the blood, but then he interrupted the Mass and asked to be taken to the neighboring city of Orvieto, where Pope Urban IV was then residing. The Pope listened to the priest's account and dismissed him. He then sent emissaries for an immediate investigation. When all the facts were ascertained, he ordered the Bishop of the Diocese to bring the Host and the linen cloth bearing the stains of blood to Orvieto. With Archbishops, Cardinals and other Church dignitaries in attendance, the Pope met the procession and, amid great pomp, had the relics placed in the Cathedral. The linen corporal bearing the spots of blood is still reverently enshrined and exhibited in the Cathedral of Orvieto. Soon after the miracle of Orvieto Urban IV commissioned St. Thomas Aquinas to compose the Proper for a Mass and an Office for the feast day. 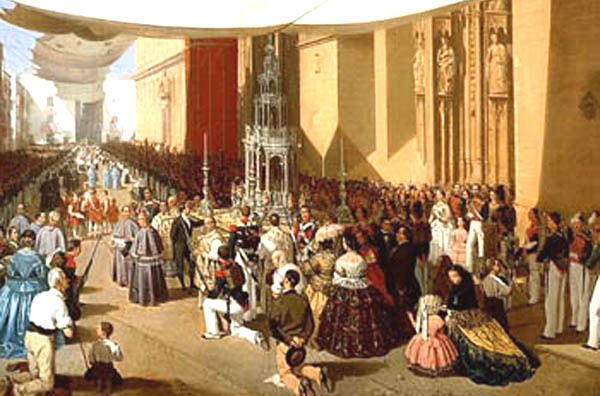 One year later, in August of 1264, Urban IV, by means of the papal Bull Transiturus, instituted the feast of Corpus Christi for the universal Church. At the same time he granted many indulgences to the faithful for attendance at Mass and the Office. 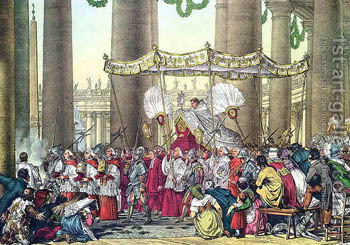 The triumph of the Blessed Sacrament was complete, and the devotion spread throughout the length and breadth of Europe. 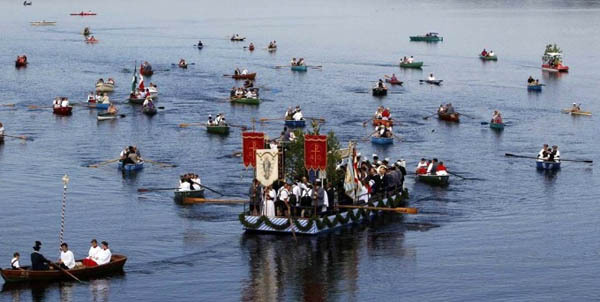 From that time [until after Vatican II], every church in a Catholic country, from the cathedral of a royal city to the most modest village chapel, kept the festival on the Thursday following Trinity Sunday. The procession would issue into the streets followed by the authorities of the realm. It is the public recognition by the Catholic world of Jesus in the Blessed Sacrament. Prophetically Our Lord saw that in the future this very doctrine would be attacked and the Faith would be placed in sore danger. In the zenith of the Church’s medieval splendor, He foresaw our times. Surely no command was ever better fulfilled than that which promised the Church good service by the institution of the feast of Corpus Christi. In France it survived every civil revolution; its re-establishment has ever been due to the Church's influence. She is the dove with the olive branch which symbolizes the passing away of the mighty deluge. 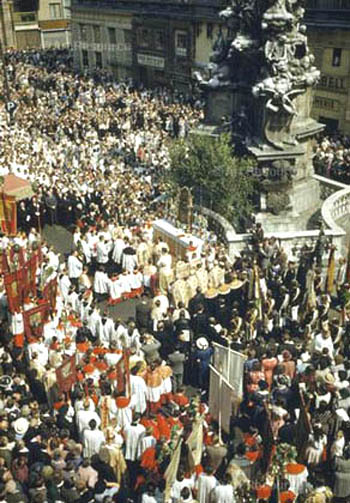 “The memory of the procession in which, when a child, he scattered flowers before the Blessed Sacrament as it passed through the streets, is a hold on the libertine himself and the pledge of his final conversion. For a return to those days, is the sigh and prayer of faithful Catholics in the 21st century.